Enter the hall of Norse gods and let the power of Thor’s hammer lead you to the godly jackpot. NetEnt developers offer you another progressive slot with a popular theme and handsome payouts. But the main attraction here is the progressive jackpot with the current value of 2,265,534.83! Stay tuned and learn more about this divine slot. 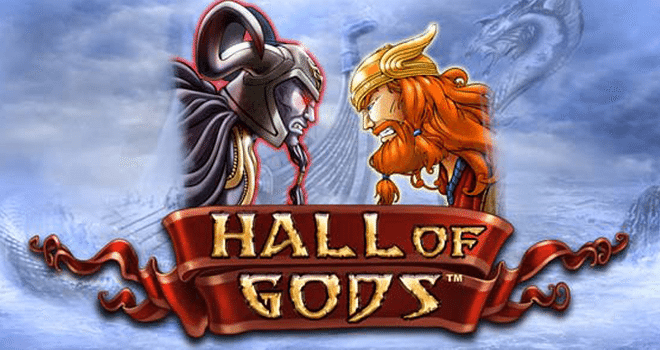 Hall of Gods, as the name already suggests, is based on Norse mythology. All the details of the slot are related to the theme from adorned reel board, suspense soundtrack to the divine symbols. Five main symbols are, of course, gods from the Norse mythology. These are the high-paying symbols and they include the mighty Odin, Thor the god of thunder, courageous Freya, Loki the trickster god and beautiful goddess of youth, Idun. The remaining 5 symbols make the group of low-paying symbols that include a chest with apples, a necklace, an axe, Thor’s hammer and a ring embellished with gold. But, three more important symbols are the wild symbol (a serpent) which entirely expands on reels 2, 3, and 4 giving you bigger opportunities for winning big and substitutes for all other symbols except for the following two: scatter symbol (the ravens) which triggers the Free Spins game and the Bonus symbol which provides you with the chance of winning the jackpot. As usually, Free Spins is activated by landing 3, 4 or 5 scatters on the reels. How many free spins you get depends on how many scatters you land. You may get 10, 15, or even 20 free spins with the chance to activate the additional free games. Another treat is that during the Free Spins round all wins are multiplied by 3. Your chances for winning big are only just increasing. Just like with the NetEnt’s Mega Fortune slot, the Bonus feature is the one with the chance of winning 1 out of 3 jackpots. But if we put aside Midi and Mini Jackpot, Mega Jackpot is the one to shoot at. Either way, first you have to unlock the bonus feature by landing 3 Bonus symbols on the reels. When unlocked, a new screen will show where you use Thor’s hammer to smash and reveal the prizes beneath the shields. The goal is to match 3 of the same prizes or 3 of the same jackpot symbols to win. If you get lucky enough and crack out 3 Mega Jackpot signs your life will change drastically. This 5-reel 20-payline slot offers different betting options. While paylines are fixed, bet levels and coin values are adjustable. In this sense, the minimum bet you can make per spin is £0.20 while if you are feeling adventurous or want to take bigger risks you can make a maximum bet of £50. At any time, you can adjust the Autoplay option and set the reels to spin automatically from 10 to 1000 rounds. This is quite convenient for those who like to bet smaller amounts and play longer hours. NetEnt people are constantly providing us with amazing progressive slots and Hall of Gods goes under that category. Besides the chance of hitting that Mega Jackpot, this slot has to offer generous free spins along with multipliers and nice payouts overall. All in all, you are recommended to try out this slot and see if the power of Norse gods is on your side.